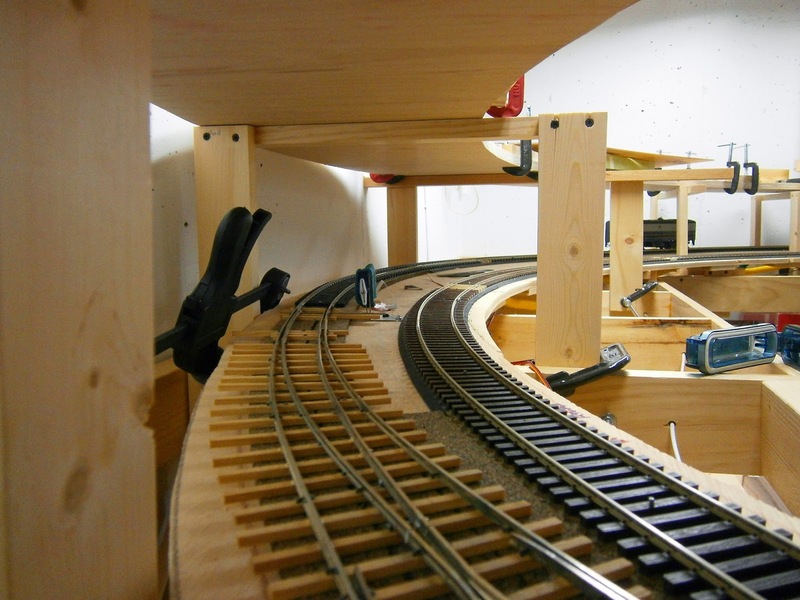 I've recently completed some work on the layout that I have been putting off for years. When I built the lower hidden staging (which was not in my original plan) I had to put a curved crossover between the inbound and outbound tracks to facilitate routing trains to/from any track of the five in staging. The crossover was hand-built before I had the Fast Track fixtures and worked out a method of laying curved turnouts in the regular straight fixture. The crossover is fine with most rolling stock. But after I had laid it, I discovered that Weaver diesels would cause one of the two turnouts to short out. Now, if you know modern O scale, Weaver diesels are staples and unavoidable. So it had to be fixed. Preliminary investigation indicated that the back of the wheelsets were shorting out on the closure rails. Fixing this would require resetting the throwbar on the offending turnout, which was already laid in place. Not a job I was looking forward to. All to moreso because the crossover is located in an area that I can reach to lay it; but to do detail work on it in place, I would have to stand on a step stool and then bend over – an invitation to a backache. So I put it off with the rationalization that I did not have to fix this until the mainline was ready to be built above. Of course, the fact that this turnout needed to be fixed before extending the mainline became an impediment to finishing the mainline. Pretty good exercise in circular logic, no? 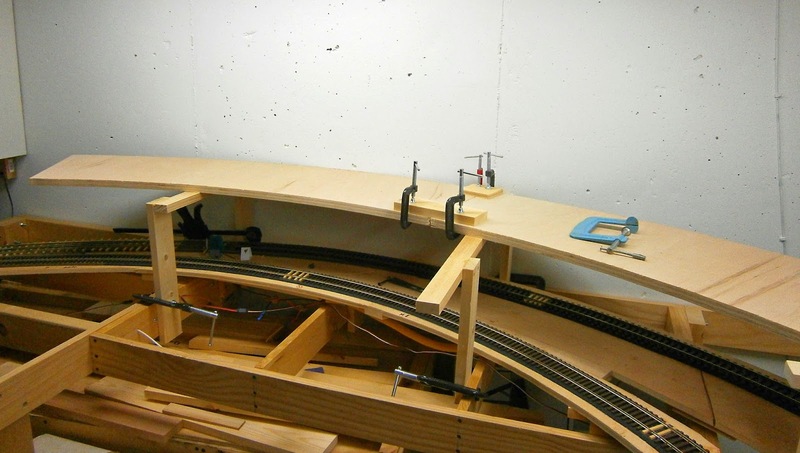 Well after nearly two years of little progress on the layout (joblessness for most of '12 and being on crutches for half of '13) I am in the process of making a maximum effort to finish at least one track of the mainline. Therefore I had to steel myself to fix this turnout and continue major track laying. This photo shows the crossover; the offending turnout is the one on the right (Yes, that's a seriously wide tie spacing on the crossover - remember, this crossover is hidden and will not be seen). Actually, absent the resulting backache and one additional problem, it wasn't as bad as I had been dreading. Repositioning the points at the throw bar did fix the shorting problem. Rechecking the entire turnout with the NMRA gauge revealed that there was a gauge problem at one of the wing/guard rails causing an ever so slight bump as trucks passed through the frog. Since this turnout will be buried under benchwork and track above, it had to be as bullet proof as possible. Filing inside the flangeways to correct the check gauge resulted in the expected backache (3 weeks and fading at this point). The truck that you see in the picture has what has become my standard wheelsets - Intermountain O scale 33" wheels. Once the check gauge was to NMRA standards, this truck passed through without any bumps. In fact, with my finger on the truck, I can barely feel the frog passage. I then tried the turnout with a six-wheel heavyweight passenger truck and - damn - the truck had a bounce going through. WTF? Back to the file, checking as I went. The turnout was to NMRA specs. Maybe, I thought, the longer truck required me to take it to the extreme wide limit of the NMRA range. When I got the turnout to the maximum allowed by the gauge, the heavyweight truck still had a bounce. Fortunately, before I went below the NMRA standards I checked the heavyweight's wheels and, surprise, surprise, the back-to-back on the wheelsets failed - too narrow. I feel really dumb - this is not the first time I've used wheelsets that were out of gauge to build or test a turnout - driving me nuts in the process. I should have checked the truck before using it as a standard. I guess that my learning curve is a flat line. The blue-green thing at the extreme right of the photo above is a servo with some sound dampening material stuck on it. This servo throws the problem turnout and it has been there almost since the turnout was laid. The other switch needed a servo before this area is covered over. Since these two turnouts are in a crossover and must always be thrown together, I had obtained some servo "Y" cables to connect both servos together so they would throw simultaneously. Since both servos would move in the same direction (CW or CCW) the second servo would have to be mounted in the proper physical orientation to move the other throwbar in the opposite direction. I tried to figure this out analytically but too many variables (facing right or left; above or below the track, etc.) made my head hurt. I finally just fashioned a crank and held the servo in place while I threw the switch and empirically determined the proper location for the servo. The next photo shows the final location and orientation. This second servo is under the roadbed (the first servo is above the roadbed) and facing in the other direction to the first servo. My head would have though that two reversals of orientation would make the throws move in the same direction; not so (that's why I'm not a mechanical engineer). 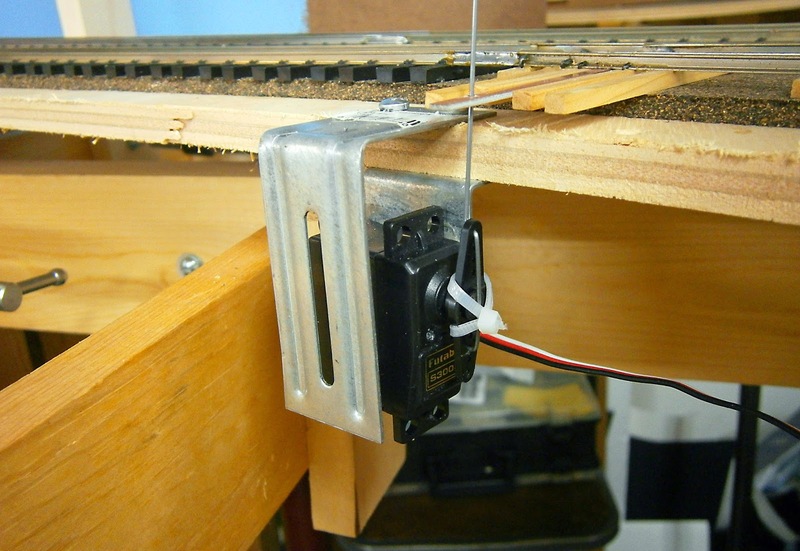 The servo is glued to a bracket as is outlined in an earlier post in this blog (A Few Simple Solutions). The second bracket that you see is just there to protect the servo because it's located above the duck-under to my workbench. With THAT job out of the way, the mainline could continue. I had cut sections of road bed to fit the three-track curve above this location a week or two before. The next few photos show the roadbed progressing on what will be "Graveyard Curve" on the Cranberry Grade. The next photos show the crossover and why it had to be just so before the mainline could continue. 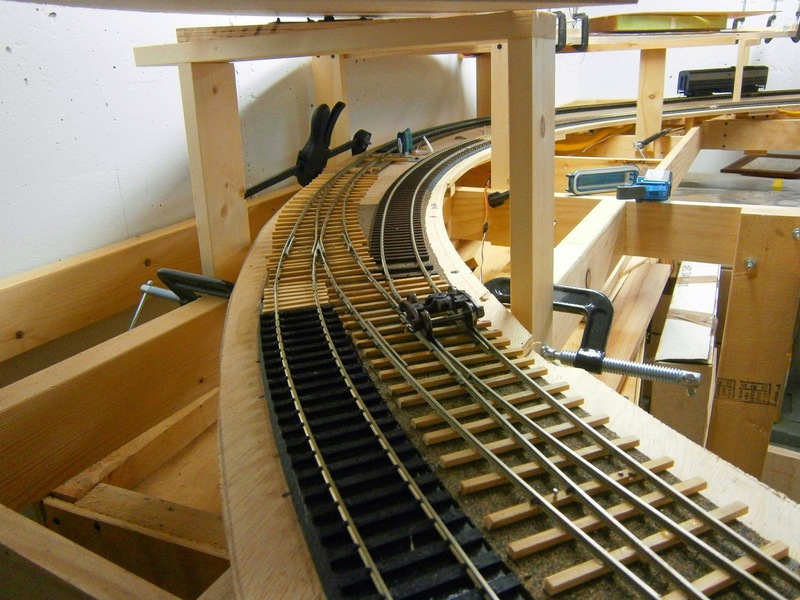 As I write this, the curve's sub roadbed is in place and I'm finishing sub roadbed at the top of the helix. Now the two ends-of-track are pointed at each other. There's a small matter of about 6 inches difference in vertical height in a run of about 14 feet - and the first time something is not as planned in 3rd Plan It. I have some re-figuring to do and probably will have to increase the grade through Graveyard Curve and the approach to Terra Alta, WV (top of the helix). By serendipity, that's exactly what the prototype had to do on the approach to Terra Alta.